WCA: "The Joy of Nelly Deane"
Source File: cat.ss014.xml From The Century Illustrated Monthly Magazine, 82 (October 1911): 859-867. "Say, Peggy, won't you go up and stay with me to-night? Scott Spinny 's asked to take me home, and I don't want to walk up with him alone." "I guess so, if you'll ask my mother." "Oh, I'll fix her!" Nell laughed, with a toss of her head which meant that she usually got what she wanted, even from people much less tractable than my mother. In a moment our tiring-women were back again. The three old ladies—at least they seemed old to us—fluttered about us, more agitated than we were ourselves. It seemed as though they would never leave off patting Nell and touching her up. They kept trying things this way and that, never able in the end to decide which way was best. They would n't hear to her using rouge, and as they powdered her neck and arms, Mrs. Freeze murmured that she hoped we would n't get into the habit of using such things. Mrs. Spinny divided her time between pulling up and tucking down the "illusion" that filled in the square neck of Nelly's dress. She did n't like things much low, she said; but after she had pulled it up, she stood back and looked at Nell thoughtfully through her glasses. While the excited girl was reaching for this and that, buttoning a slipper, pinning down a curl, Mrs. Spinny's smile softened more and more until, just before Esther made her entrance, the old lady tiptoed up to her and softly tucked the illusion down as far as it would go. "She's so pink; it seems a pity not," she whispered apologetically to Mrs. Dow. Every one admitted that Nelly was the prettiest girl in Riverbend, and the gayest—oh, the gayest! When she was not singing, she was laughing. When she was not laid up with a broken arm, the outcome of a foolhardy coasting feat, or suspended from school because she ran away at recess to go buggy-riding with Guy Franklin, she was sure to be up to mischief of some sort. Twice she broke through the ice and got soused in the river because she never looked where she skated or cared what happened so long as she went fast enough. After the second of these duckings our three dressers declared that she was trying to be a Baptist despite herself. Mrs. Spinny and Mrs. Freeze and Mrs. Dow, who were always hovering about Nelly, often whispered to me their hope that she would eventually come into our church and not "go with the Methodists"; her family were Wesleyans. But to me these artless plans of theirs never wholly explained their watchful affection. 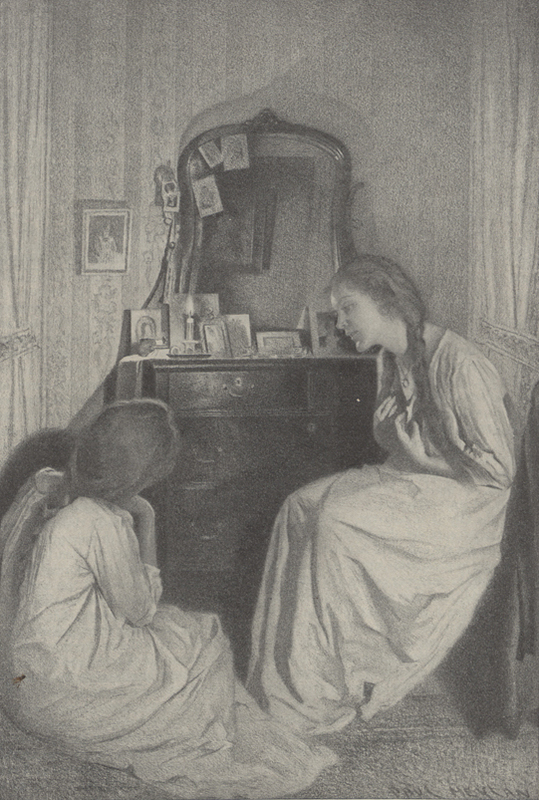 They had good daughters themselves—except Mrs. Spinny, who had only the sullen Scott,—and they loved their plain girls and thanked God for them. But they loved Nelly differently. They were proud View Image of Page 860 of her pretty figure and yellow-brown eyes, which dilated so easily and sparkled with a kind of golden effervescence. They were always making pretty things for her, always coaxing her to come to the sewing circle, where she knotted her thread, and put in the wrong sleeve, and laughed and chattered and said a great many things that she should not have said, and somehow always warmed their hearts. I think they loved her for her unquenchable joy. All the Baptist ladies liked Nell, even those who criticized her most severely, but the three who were first in fighting the battles of our little church, who held it together by their prayers and the labor of their hands, watched over her as they did over Mrs. Dow's century-plant before it blossomed. They looked for her on Sunday morning and smiled at her as she hurried, always a little late, up to the choir. When she rose and stood behind the organ and sang "There Is a Green Hill," one could see Mrs. Dow and Mrs. Freeze settle back in their accustomed seats and look up at her as if she had just come from that hill and had brought them glad tidings. It was because I sang contralto, or, as we said, alto, in the Baptist choir that Nell and I became friends. She was so gay and grown up, so busy with parties and dances and picnics, that I would scarcely have seen much of her had we not sung together. She liked me better than she did any of the older girls, who tried clumsily to be like her, and I felt almost as solicitous and admiring as did Mrs. Dow and Mrs. Spinny. I think even then I must have loved to see her bloom and glow, and I loved to hear her sing, in "The Ninety and Nine," But one was out on the hills away in her sweet, strong voice. Nell had never had a singing lesson, but she had sung from the time she could talk, and Mrs. Dow used fondly to say that it was singing so much that made her figure so pretty. After I went into the choir it was found to be easier to get Nelly to choir practice. If I stopped outside her gate on my way to church and coaxed her, she usually laughed, ran in for her hat and jacket, and went along with me. The three old ladies fostered our friendship, and because I was "quiet," they esteemed me a good influence for Nelly. This view was propounded in a sewing-circle discussion and, leaking down to us through our mothers, greatly amused us. Dear old ladies! It was so manifestly for what Nell was that they loved her, and yet they were always looking for "influences" to change her. The "Queen Esther" performance had cost us three months of hard practice, and it was not easy to keep Nell up to attending the tedious rehearsals. Some of the boys we knew were in the chorus of Assyrian youths, but the solo cast was made up of older people, and Nell found them very poky. We gave the cantata in the Baptist church on Christmas Eve, "to a crowded house," as the Riverbend "Messenger" truly chronicled. The country folk for miles about had come in through a deep snow, and their teams and wagons stood in a long row at the hitch-bars on each side of the church door. It was certainly Nelly's night, for however much the tenor—he was her schoolmaster, and naturally thought poorly of her—might try to eclipse her in his dolorous solos about the rivers of Babylon, there could be no doubt as to whom the people had come to hear—and to see. After the performance was over, our fathers and mothers came back to the dressing- rooms—the little rooms behind the baptistry where the candidates for baptism were robed—to congratulate us, and Nell persuaded my mother to let me go home with her. This arrangement may not have been wholly agreeable to Scott Spinny, who stood glumly waiting at the baptistry door; though I used to think he dogged Nell's steps not so much for any pleasure he got from being with her as for the pleasure of keeping other people away. Dear little Mrs. Spinny was perpetually in a state of humiliation on account of his bad manners, and she tried by a very special tenderness to make up to Nelly for the remissness of her ungracious son. "Have you got your high shoes on?" "No; but I've got rubbers on over my low ones. Mother does n't care." "Well, you just go back and put 'em on as fast as you can." Nell made a face at him and ran back, laughing. Her mother, fat, comfortable Mrs. Deane, was immensely amused at this. "That 's right, Scott," she chuckled. "You can do enough more with her than I can. She walks right over me an' Jud." Scott grinned. If he was proud of Nelly, the last thing he wished to do was to show it. When she came back he began to nag again. "What are you going to do with all those flowers? They'll freeze stiff as pokers." "Well, there won't none of your flowers freeze, Scott Spinny, so there!" Nell snapped. She had the best of him that time, and the Assyrian youths rejoiced. They were most of them high-school boys, and the poorest of them had "chipped in" and sent all the way to Denver for Queen Esther's flowers. There were bouquets from half a dozen townspeople, too, but none from Scott. Scott was a prosperous hardware merchant and notoriously penurious, though he saved his face, as the boys said, by giving liberally to the church. "There 's no use freezing the fool things, anyhow. You get me some newspapers, and I 'll wrap 'em up." Scott took from his pocket a folded copy of the Riverbend "Messenger" and began laboriously to wrap up one of the bouquets. When we left the church door he bore three large newspaper bundles, carrying them as carefully as if they had been so many newly frosted wedding-cakes, and left Nell and me to shift for ourselves as we floundered along the snow-burdened sidewalk. Although it was after midnight, lights were shining from many of the little wooden houses, and the roofs and shrubbery were so deep in snow that Riverbend looked as if it had been tucked down into a warm bed. The companies of people, all coming from church, tramping this way and that toward their homes and calling "Good night" and "Merry Christmas" as they parted company, all seemed to us very unusual and exciting. When we got home, Mrs. Deane had a cold supper ready, and Jud Deane had already taken off his shoes and fallen to on his fried chicken and pie. He was so proud of his pretty daughter that he must give her her Christmas presents then and there, and he went into the sleeping-chamber behind the dining-room and from the depths of his wife's closet brought out a short sealskin jacket and a round cap and made Nelly put them on. Mrs. Deane, who sat busy between a plate of spice cake and a tray piled with her famous whipped cream tarts, laughed inordinately at his behavior. "Ain't he worse than any kid you ever see? He 's been running to that closet like a cat shut away from her kittens. I wonder Nell ain't caught on before this. I did think he 'd make out now to keep 'em till Christmas morning; but he 's never made out to keep anything yet." That was true enough, and fortunately Jud's inability to keep anything seemed always to present a highly humorous aspect to his wife. Mrs. Deane put her heart into her cooking, and said that so long as a man was a good provider she had no cause to complain. Other people were not so charitable toward Jud's failing. I remember how many strictures were passed upon that little sealskin and how he was censured for his extravagance. But what a public-spirited thing, after all, it was for him to do! How, the winter through, we all enjoyed seeing Nell skating on the river or running about the town with the brown collar turned up about her bright cheeks and her hair blowing out from under the round cap! "No seal," Mrs. Dow said, "would have begrudged it to her. Why should we?" This was at the sewing-circle, when the new coat was under grave discussion. At last Nelly and I got up-stairs and undressed, and the pad of Jud's slippered feet about the kitchen premises—where he was carrying up from the cellar things that might freeze—ceased. He called "Good night, daughter," from the foot of the stairs, and the house grew quiet. But one is not a prima donna the first time for nothing, and it seemed as if we could not go to bed. Our light must have burned long after every other in Riverbend was View Image of Page 862 out. The muslin curtains of Nell's bed were drawn back; Mrs. Deane had turned down the white counterpane and taken off the shams and smoothed the pillows for us. But their fair plumpness offered no temptation to two such hot young heads. We could not let go of life even for a little while. We sat and talked in Nell's cozy room, where there was a tiny, white fur rug—the only one in Riverbend—before the bed; and there were white sash curtains, and the prettiest little desk and dressing-table I had ever seen. It was a warm, gay little room, flooded all day long with sunlight from east and south windows that had climbing-roses all about them in summer. About the dresser were photographs of adoring high-school boys; and one of Guy Franklin, much groomed and barbered, in a dress coat and a boutonnière. I never liked to see that photograph there. The home boys looked properly modest and bashful on the dresser, but he seemed to be staring impudently all the time. I knew nothing definite against Guy, but in Riverbend all "traveling men" were considered worldly and wicked. He traveled for a Chicago dry-goods firm, and our fathers did n't like him because he put extravagant ideas into our mothers' heads. He had very smooth and flattering ways, and he introduced into our simple community a great variety of perfumes and scented soaps, and he always reminded me of the merchants in Cæsar, who brought into Gaul "those things which effeminate the mind," as we translated that delightfully easy passage. Nell was sitting before the dressing-table in her nightgown, holding the new fur coat and rubbing her cheek against it, when I saw a sudden gleam of tears in her eyes. "You know, Peggy," she said in her quick, impetuous way, "this makes me feel bad. I've got a secret from my daddy." I can see her now, so pink and eager, her brown hair in two springy braids down her back, and her eyes shining with tears and with something even softer and more tremulous. "I 'm engaged, Peggy," she whispered, "really and truly." She leaned forward, unbuttoning her nightgown, and there on her breast, hung by a little gold chain about her neck, was a diamond ring—Guy Franklin's solitaire; every one in Riverbend knew it well. "I'm going to live in Chicago, and take singing lessons, and go to operas, and do all those nice things—oh everything! I know you don't like him, Peggy, but you know you are a kid. You'll see how it is yourself when you grow up. He's so different from our boys, and he's just terribly in love with me. And then, Peggy,"—flushing all down over her soft shoulders,— "I 'm awfully fond of him, too. Awfully." "Are you, Nell, truly?" I whispered. She seemed so changed to me by the warm light in her eyes and that delicate suffusion of color. I felt as I did when I got up early on picnic mornings in summer, and saw the dawn come up in the breathless sky above the river meadows and make all the corn-fields golden. "Sure I do, Peggy; don't look so solemn. It's nothing to look that way about, kid. It's nice." She threw her arms about me suddenly and hugged me. "I hate to think about your going so far away from us all, Nell." "Oh, you 'll love to come and visit me. Just you wait." She began breathlessly to go over things Guy Franklin had told her about Chicago, until I seemed to see it all looming up out there under the stars that kept watch over our little sleeping town. We had neither of us ever been to a city, but we knew what it would be like. We heard it throbbing like great engines, and calling to us, that far-away world. Even after we had opened the windows and scurried into bed, we seemed to feel a pulsation across all the miles of snow. The winter silence trembled with it, and the air was full of something new that seemed to break over us in soft waves. In that snug, warm little bed I had a sense of imminent change and danger. I was somehow afraid for Nelly when I heard her breathing so quickly beside me, and I put my arm about her protectingly as we drifted toward sleep. In the following spring we were both graduated from the Riverbend high school, and I went away to college. My family moved to Denver, and during the next four years I heard very little of Nelly Deane. My life was crowded with new people and new experiences, and I am View Image of Page 863 afraid I held her little in mind. I heard indirectly that Jud Deane had lost what little property he owned in a luckless venture in Cripple Creek, and that he had been able to keep his house in Riverbend only through the clemency of his creditors. Guy Franklin had his route changed and did not go to Riverbend any more. He married the daughter of a rich cattle-man out near Long Pine, and ran a dry-goods store of his own. Mrs. Dow wrote me a long letter about once a year, and in one of these she told me that Nelly was teaching in the sixth grade in the Riverbend school. "Dear Nelly does not like teaching very well. The children try her, and she is so pretty it seems a pity for her to be tied down to uncongenial employment. Scott is still very attentive, and I have noticed him look up at the window of Nelly's room in a very determined way as he goes home to dinner. Scott continues prosperous; he has made money during these hard times and now owns both our hardware stores. He is close, but a very honorable fellow. Nelly seems to hold off, but I think Mrs. Spinny has hopes. Nothing would please her more. If Scott were more careful about his appearance, it would help. He of course gets black about his business, and Nelly, you know, is very dainty. People do say his mother does his courting for him, she is so eager. If only Scott does not turn out hard and penurious like his father! We must all have our schooling in this life, but I don't want Nelly's to be too severe. She is a dear girl, and keeps her color." Mrs. Dow's own schooling had been none too easy. Her husband had long been crippled with rheumatism, and was bitter and faultfinding. Her daughters had married poorly, and one of her sons had fallen into evil ways. But her letters were always cheerful, and in one of them she gently remonstrated with me because I "seemed inclined to take a sad view of life." In the winter vacation of my senior year I stopped on my way home to visit Mrs. Dow. The first thing she told me when I got into her old buckboard at the station was that "Scott had at last prevailed," and that Nelly was to marry him in the spring. As a preliminary step, Nelly was about to join the Baptist church. "Just think, you will be here for her baptizing! How that will please Nelly! She is to be immersed to-morrow night." I met Scott Spinny in the post office that morning, and he gave me a hard grip with one black hand. There was something grim and saturnine about his powerful body and bearded face and his strong, cold hands. I wondered what perverse fate had driven him for eight years to dog the footsteps of a girl whose charm was due to qualities naturally distasteful to him. It still seems strange to me that in easy-going Riverbend, where there were so many boys who could have lived contentedly enough with my little grasshopper, it was the pushing ant who must have her and all her careless ways. By a kind of unformulated etiquette one did not call upon candidates for baptism on the day of the ceremony, so I had my first glimpse of Nelly that evening. The baptistry was a cemented pit directly under the pulpit rostrum, over which we had our stage when we sang "Queen Esther." I sat through the sermon somewhat nervously. After the minister, in his long, black gown, had gone down into the water and the choir had finished singing, the door from the dressing-room opened, and, led by one of the deacons, Nelly came down the steps into the pool. Oh, she looked so little and meek and chastened! Her white cashmere robe clung about her, and her brown hair was brushed straight back and hung in two soft braids from a little head bent humbly. As she stepped down into the water I shivered with the cold of it, and I remembered sharply how much I had loved her. She went down until the water was well above her waist, and stood white and small, with her hands crossed on her breast, while the minister said the words about being buried with Christ in baptism. Then, lying in his arm, she disappeared under the dark water. "It will be like that when she dies," I thought, and a quick pain caught my heart. The choir began to sing "Washed in the Blood of the Lamb" as she rose again, the door behind the baptistry opened, revealing those three dear guardians, Mrs. Dow, Mrs. Freeze, and Mrs. Spinny, and she went up into their arms. I went to see Nell next day, up in the little room of many memories. Such a View Image of Page 864 sad, sad visit! She seemed changed—a little embarrassed and quietly despairing. We talked of many of the old Riverbend girls and boys, but she did not mention Guy Franklin or Scott Spinny, except to say that her father had got work in Scott's hardware store. She begged me, putting her hands on my shoulders with something of her old impulsiveness, to come and stay a few days with her. But I was afraid—afraid of what she might tell me and of what I might say. When I sat in that room with all her trinkets, the foolish harvest of her girlhood, lying about, and the white curtains and the little white rug, I thought of Scott Spinny with positive terror and could feel his hard grip on my hand again. I made the best excuse I could about having to hurry on to Denver; but she gave me one quick look, and her eyes ceased to plead. I saw that she understood me perfectly. We had known each other so well. Just once, when I got up to go and had trouble with my veil, she laughed her old merry laugh and told me there were some things I would never learn, for all my schooling. The next day, when Mrs. Dow drove me down to the station to catch the morning train for Denver, I saw Nelly hurrying to school with several books under her arm. She had been working up her lessons at home, I thought. She was never quick at her books, dear Nell. "You will be sad to hear that two months ago our dear Nelly left us. It was a terrible blow to us all. I cannot write about it yet, I fear. I wake up every morning feeling that I ought to go to her. She went three days after her little boy was born. The baby is a fine child and will live, I think, in spite of everything. He and her little girl, now eight years old, whom she named Margaret, after you, have gone to Mrs. Spinny's. She loves them more than if they were her own. It seems as if already they had made her quite young again. I wish you could see Nelly's children." Ah, that was what I wanted, to see Nelly's children! The wish came aching from my heart along with the bitter homesick tears; along with a quick, torturing recollection that flashed upon me, as I looked about and tried to collect myself, of how we two had sat in our sunny seat in the corner of the old bare school-room one September afternoon and learned the names of the seven hills together. In that place, at that moment, after so many years, how it all came back to me—the warm sun on my back, the chattering girl beside me, the curly hair, the laughing yellow eyes, the stubby little finger on the page! I felt as if even then, when we sat in the sun with our heads together, it was all arranged, written out like a story, that at this moment I should be sitting among the crumbling bricks and drying grass, and she should be lying in the place I knew so well, on that green hill far away. Mrs. Dow sat with her Christmas sewing in the familiar sitting-room, where the carpet and the wall-paper and the table-cover had all faded into soft, dull colors, and even the chromo of Hagar and Ishmael had been toned to the sobriety of age. In the bay-window the tall wire flower-stand still bore its little terraces of potted plants, and the big fuchsia and the Martha Washington geranium had blossomed for Christmastide. Mrs. Dow herself did not look greatly changed to me. Her hair, thin ever since I could remember it, was now quite white, but her spare, wiry little person had all its old activity, and her eyes gleamed with the old friendliness behind her silver-bowed glasses. Her gray house-dress seemed just like those she used to wear when I ran in after school to take View Image of Page 865 her angel-food cake down to the church supper. "And now, Mrs. Dow, tell me about the one we loved best of all. Since I got your letter I've thought of her every day. Tell me all about Scott and Nelly." The tears flashed behind her glasses, and she smoothed the little pink bag on her knee. "Well, dear, I'm afraid Scott proved to be a hard man, like his father. But we must remember that Nelly always had Mrs. Spinny. I never saw anything like the love there was between those two. After Nelly lost her own father and mother, she looked to Mrs. Spinny for everything. When Scott was too unreasonable, his mother could 'most always prevail upon him. She never lifted a hand to fight her own battles with Scott's father, but she was never afraid to speak up for Nelly. And then Nelly took great comfort of her little girl. Such a lovely child!" "Had she been very ill before the little baby came?" "No, Margaret; I'm afraid 't was all because they had the wrong doctor. I feel confident that either Doctor Tom or Doctor Jones could have brought her through. But, you see, Scott had offended them both, and they 'd stopped trading at his store, so he would have young Doctor Fox, a boy just out of college and a stranger. He got scared and did n't know what to do. Mrs. Spinny felt he was n't doing right, so she sent for Mrs. Freeze and me. It seemed like Nelly had got discouraged. Scott would move into their big new house before the plastering was dry, and though 't was summer, she had taken a terrible cold that seemed to have drained her, and she took no interest in fixing the place up. Mrs. Spinny had been down with her back again and was n't able to help, and things was just anyway. We won't talk about that, Margaret; I think 't would hurt Mrs. Spinny to have you know. She nearly died of mortification when she sent for us, and blamed her poor back. We did get Nelly fixed up nicely before she died. I prevailed upon Doctor Tom to come in at the last, and it 'most broke his heart. 'Why, Mis' Dow,' he said, 'if you'd only have come and told me how 't was, I'd have come and carried her right off in my arms.'" "Oh, Mrs. Dow," I cried, "then it need n't have been?" Mrs. Dow dropped her needle and clasped her hands quickly. "We must n't look at it that way, dear," she said tremulously and a little sternly; "we must n't let ourselves. We must just feel that our Lord wanted her then, and took her to Himself. When it was all over, she did look so like a child of God, young and trusting, like she did on her baptizing night, you remember?" I felt that Mrs. Dow did not want to talk any more about Nelly then, and, indeed, I had little heart to listen; so I told her I would go for a walk, and suggested that I might stop at Mrs. Spinny's to see the children. Mrs. Dow looked up thoughtfully at the clock. "I doubt if you'll find little Margaret there now. It's half-past four, and she'll have been out of school an hour and more. She'll be most likely coasting on Lupton's Hill. She usually makes for it with her sled the minute she is out of the school-house door. You know, it 's the old hill where you all used to slide. If you stop in at the church about six o'clock, you'll likely find Mrs. Spinny there with the baby. I promised to go down and help Mrs. Freeze finish up the tree, and Mrs. Spinny said she'd run in View Image of Page 866 with the baby, if 't was n't too bitter. She won't leave him alone with the Swede girl. She's like a young woman with her first." Lupton's Hill was at the other end of town, and when I got there the dusk was thickening, drawing blue shadows over the snowy fields. There were perhaps twenty children creeping up the hill or whizzing down the packed sled-track. When I had been watching them for some minutes, I heard a lusty shout, and a little red sled shot past me into the deep snow-drift beyond. The child was quite buried for a moment, then she struggled out and stood dusting the snow from her short coat and red woolen comforter. She wore a brown fur cap, which was too big for her and of an old-fashioned shape, such as girls wore long ago, but I would have known her without the cap. Mrs. Dow had said a beautiful child, and there would not be two like this in Riverbend. She was off before I had time to speak to her, going up the hill at a trot, her sturdy little legs plowing through the trampled snow. When she reached the top she never paused to take breath, but threw herself upon her sled and came down with a whoop that was quenched only by the deep drift at the end. "Are you Margaret Spinny?" I asked as she struggled out in a cloud of snow. "Yes, 'm." She approached me with frank curiosity, pulling her little sled behind her. "Are you the strange lady staying at Mrs. Dow's?" I nodded, and she began to look my clothes over with respectful interest. "Your grandmother is to be at the church at six o'clock, is n't she?" "Well, suppose we walk up there now. It 's nearly six, and all the other children are going home." She hesitated, and looked up at the faintly gleaming track on the hill-slope. "Do you want another slide? Is that it?" I asked. "Do you mind?" she asked shyly. "No. I'll wait for you. Take your time; don't run." Two little boys were still hanging about the slide, and they cheered her as she came down, her comforter streaming in the wind. "Now," she announced, getting up out of the drift, "I 'll show you where the church is." "Shall I tie your comforter again?" "No, 'm, thanks. I 'm plenty warm." She put her mittened hand confidingly in mine and trudged along beside me. Mrs. Dow must have heard us tramping up the snowy steps of the church, for she met us at the door. Every one had gone except the old ladies. A kerosene lamp flickered over the Sunday-school chart, with the lesson-picture of the Wise Men, and the little barrel-stove threw out a deep glow over the three white heads that bent above the baby. There the three friends sat, patting him, and smoothing his dress, and playing with his hands, which made theirs look so brown. "You ain't seen nothing finer in all your travels," said Mrs. Spinny, and they all laughed. They showed me his full chest and how strong his back was; had me feel the golden fuzz on his head, and made him look at me with his round, bright eyes. He laughed and reared himself in my arms as I took him up and held him close to me. He was so warm and tingling with life, and he had the flush of new beginnings, of the new morning and the new rose. He seemed to have come so lately from his mother's heart! It was as if I held her youth and all her young joy. As I put my cheek down against his, he spied a pink flower in my hat, and making a gleeful sound, he lunged at it with both fists. "Don't let him spoil it," murmured Mrs. Spinny. "He loves color so—like Nelly." View Image of Page 867 "'I'M ENGAGED, PEGGY'"Drawn by Paul Meylan. Half-tone plate engraved by C. W. Chadwick.